Limnu is here to stay! First, let us get one thing out of the way: Limnu is not going away. 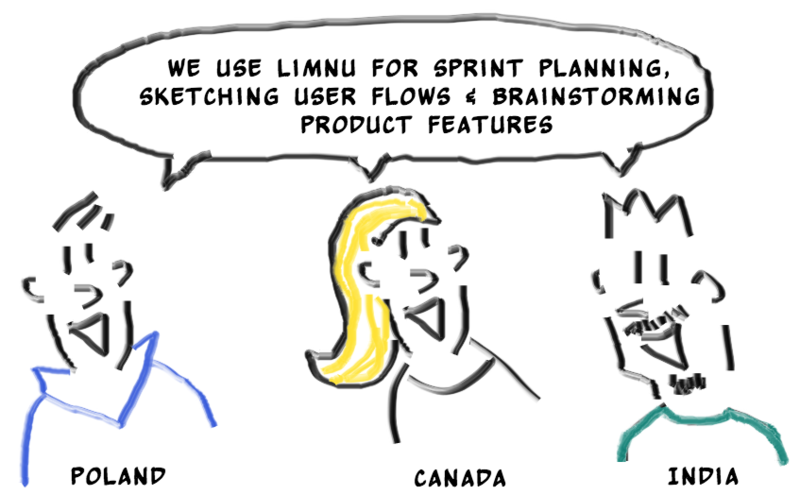 Rest assured, Limnu’s awesome whiteboarding features will remain available and affordable. As we’ve heard from many of our customers, Limnu’s ease of use, fast refresh rate, realistic drawing, and inexpensive subscriptions make it the most compelling online whiteboard on the market. Frankly, that’s why we were acquired. We have exciting plans in the coming months and year. Since the acquisition, we have been heads down working to bring back all your favorite Limnu features. We’ll also start the process of integrating Limnu’s smooth, responsive drawing capabilities with ZipSocket’s machine intelligence to provide a single collaboration platform for customers. We recently relaunched PRO and TEAM Plans. With either plan you get unlimited boards that are always accessible to you and anyone you share them with. If you haven’t visited Limnu in awhile, the next time you login you’ll be placed on a 14 day free trial. Your whiteboards will continue to remain available until the end of your trial. After 14 days you’ll need to enter your credit card to keep accessing your boards and other great PRO and TEAM features. What plan is right for you? TEAM plans are best for groups of people who collaborate regularly together. You control who is on the team. All members can use the team's boards. 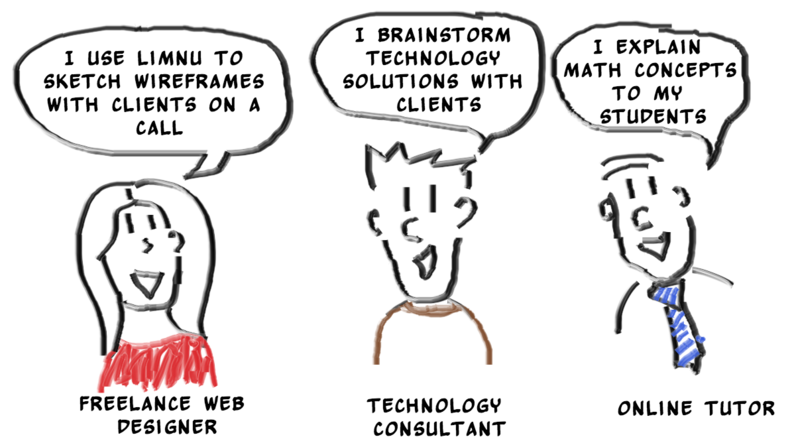 PRO plans are best for individuals like tutors or consultants. You specify who can use each board. Everyone you shared it with will be able to access the board without paying for a Limnu plan. Here are a few other enhancements we plan to release in the coming month. Within a Slack channel you will be able to create and join a Limnu whiteboard. Slack will notify the channel and everyone can join the board with a single click. Limnu whiteboards already have navigation pins to let people jump to specified areas on your whiteboard. We’re enhancing this experience to make it easier for users to navigate through your board on their own. We’re also looking into adding a Follow Me option for owners of boards. When turned on it will ensure that everyone else on the board will always see what you are drawing. Let us know what suggestions you have on features we should be working on to make our whiteboards more effective for you. There are many use cases where people need to switch between presenting material and collaborating on whiteboards. For example, say you are presenting slides in a meeting when someone struggles to understand a concept you are explaining. If you are in a meeting room, you can draw it out on a whiteboard to help clarify the concept. Our goal is to bring that same experience to remote meetings. ZipSocket saves time by making it easier to connect to meetings. We’ll be bringing that capability to Limnu; Imagine a button that shares your Limnu board with everyone in the same room, or conference call. We use machine intelligence to make this happen without invites or email. You can try it out for your screen sharing needs at ZipSocket.com. We’ll keep you posted on our progress in the coming months. The point is our consolidated platform will provide you with an online meeting and brainstorming tool that gets users collaborating naturally and quickly. You’ll spend less time futzing and more time collaborating. Hey, maybe we should call ourselves the futz-busters? I ain’t afraid of no futz. Now that you know our vision, let me tell you a little more on how the acquisition came about. What do Shrek and collaboration tools have in common? They both get you ogre-nized! Sorry, that’s a really bad joke. What they really have in common is that the founders of two collaboration companies, Limnu and ZipSocket, worked at DreamWorks Animation, creators of Shrek. The co-founders of Limnu, David (grue) DeBry and David Hart have designed visual tools for studios including DreamWorks, Industrial Light and Magic and Disney. ZipSocket’s founder, Andrew Kunz, has developed software for consumer products and services, animation and visual effects. At DreamWorks Animation he managed the R&D of their proprietary feature animation rendering software. Why is their shared experience important? While working in computer animation firms each developed an appreciation for sharing visual content. When developing complex rendering software for creating lighting, water or dust effects for box office movies, it’s important that everyone is on the same page. Sharing visual content, either through drawing complex concepts or sharing a presentation, helps everyone understand exactly what you are talking about. In 2015 David and Grue joined forces to develop Limnu because they saw the need for a collaborative online whiteboard in their own work experience. They set out to build the easiest to use whiteboard that is fast enough to collaborate in real-time and feels like a real whiteboard. Separately, Andrew was inspired to launch ZipSocket after witnessing an extremely frustrated trainer take over 15 minutes to present his meeting material. In 2016, he set out to build an easier way to connect to online meetings. 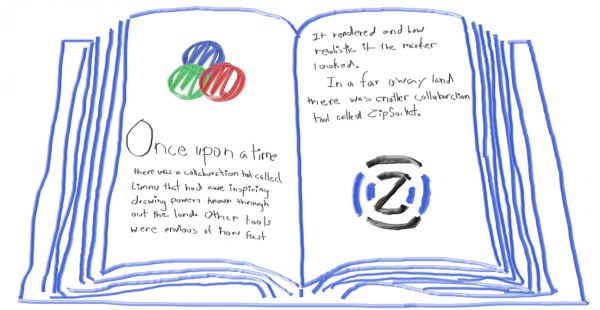 Read more on how ZipSocket works and why people say it feels like magic. David and Andrew had known each other years ago, but weren’t aware of each other’s efforts until a mutual friend called, “You guys should talk.” That talk happened in 2017 and the synergies between the companies were obvious. As the planets aligned in 2018, the acquisition came to be. It has been a whirlwind of a year for us with the acquisition and the relaunch of many features. It’s exciting times here at Limnu and we’re extremely optimistic about the future. Stay tuned for more in the coming months!